Many real estate professionals choose a self-defense tool based on recommendations from friends, family, and colleagues or online research. This might sound logical, but it fails to address the most important aspect of the decision-making process: emotion. Do you have the stomach to use the weapon your peers are recommending in the heat of the moment? Can you handle using a weapon at all? For those who can’t cope with resorting to violence, it might be better to have an escape plan to get away from danger without the need for a weapon. 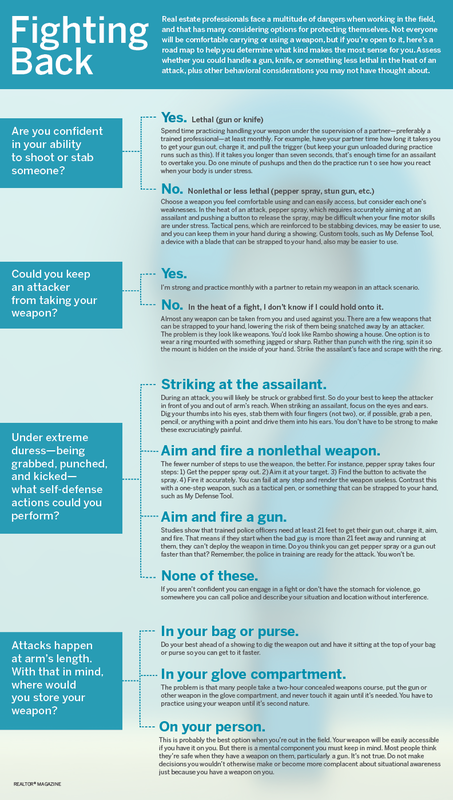 Whatever your choice of weaponry, put aside the mechanics of how the self-defense tool works most effectively, and let’s explore whether your weapon is a good match for you. Let’s break your choices down into two categories: lethal and nonlethal (or less lethal) weapons. Click here to view a road map of questions to help lead you to the right weapon of choice. Obviously, a lethal weapon is one that is capable of producing great bodily harm or death. The first weapon that comes to mind is a gun, but there are others that provide the means to kill. And while there are many varying state and federal laws governing gun use, anyone can carry, say, a kitchen knife without a permit. Concealed firearms: One thing to remember about using a gun is that there is a huge difference between firing at target paper at and firing at people. Beyond the mechanics of retrieving a gun and using it properly without losing it to your attacker, the very idea of shooting another human being is not something many people are comfortable with. Understand that if you are not 100 percent prepared to shoot someone, you have no business using or owning a gun. Knives and stabbing devices: If you’ve ever cut into a chicken or turkey and hit the bone, then you have an idea of how visceral it can be to stab a person. It is the up-close and personal, bloody, penetrating use of a blade or puncturing weapon that makes them particularly distasteful to some people. A nonlethal or less lethal weapon is designed to help someone escape rather than kill or seriously injure an attacker. Keep in mind that some nonlethal weapons are banned or require a permit to use in certain states. Self-defense sprays: Pepper spray and mace, which can shoot out several feet in front of you, have the advantage of being effective from a distance. It may offer comfort to know that it can thwart an attacker before he or she gets too close to you. But that can also be a false sense of security. After all, personal attacks often happen at arm’s length. Accuracy is also an issue with sprays. Police officers get sprayed in the face during training so they can learn to function in case they end up spraying themselves or get the residue in their eyes during a struggle. The fact that they can learn to resist the pain of the spray means some attackers can, too. Few things will scare you more than spraying an attacker who ignores the pain and keeps on coming. Stun gun or Taser: These tools deliver a powerful electrical shock to the attacker. While a Taser can be fired from a distance, a stun gun requires a closer range to be effective. Both require a positive and negative connection to the target, so if just one side hits and the other misses, you’re the one that’s going to get an emotional shock when the bad guy keeps charging at you. Like the sprays, there is a process required to use either of these devices. You have to pull it out, aim, and keep it out of the hands of your attacker. Any failure and you’re in for the fight of your life. Safety apps: Smartphone apps that allow you to discreetly notify authorities or predesignated contacts when you’re in danger may provide a sense of security, but they will not save you. The average police response time to an emergency is 11 minutes, according to reports; most assaults are over in seconds. If you’re uncomfortable using a weapon and you’d rather call for help, your best bet is to go somewhere and call 911, describing to authorities your situation and location without interference. That works better than relying on an app. Easy to access. You need to be able to grab the weapon as quickly as possible, so don’t keep it at the bottom of a purse or bag. Easy to conceal. It works best when the bad guy is not even aware you have a weapon on you. If you have a pistol or hunting knife strapped to your side and in plain view, that may work as a deterrent but will probably not be practical. Easy to retain. Particularly if you introduce a lethal weapon like a gun or knife into the situation, you have to be able to hold onto it or it may be used against you. That’s one advantage nonlethal weapons have: If they are used against you, they probably won’t kill you. Your smartest choice for a self-defense is one that matches your emotional limitations in a high-stress situation. There is little room for error. During an attack, your stress level is so high that any hesitation employing a weapon greatly increases the chance it will fail to protect you. The more simple the weapon, the more chance you have to use it correctly and escape. The more steps required to use the weapon, the higher the chance of failure.